With all the political shenanigans of late (both federal and local), the respect – or lack thereof – of the taxpayers’ dollars emerges on front page news daily. If this is particularly irksome to you, you might be interested in a little history of taxation in Canada. It has been customary for tax policy to be developed to promote economic and social goals as well as to collect taxes and administer the tax system. Many of those goals had noble beginnings. When Canada was founded, we needed to attract investors and immigrants to grow our economy, not unlike today: post-financial crisis and with an aging demographic which affects productivity and the size of our tax base. Budget speeches from Confederation until 1917 were focused on attracting immigrants by maintaining low taxes. Canada’s early political leaders decided that attracting new taxpayers could be best achieved through the maintenance of low taxes vis-à-vis the Americans. For decades after confederation, our nation valued – and in fact advertised – our low tax advantage over our neighbours to the South. A recent excerpt from new book by Mark Milke called Tax Me I’m Canadian! A taxpayer’s guide to your money – and how politicians spend it, published by Thomas & Black 2013, traces this tax competition well. Since then, Canada has been, in fact, significantly influenced by U.S. taxation policies. Over time, the United States began taxing more aggressively than Canada did in the early twentieth century. It was the first to establish a central bank, an income tax and a capital tax, as well as setting the precedents of gasoline, property, and corporate tax. This journey is well described by Chris Edwards, director of tax policy studies at the Cato Institute and editor of www.DownsizingGovernment.org, in his article “We Can Cut Government: Canada Did”. What does all of this have to do with current political misbehaviours? Just this: in the U.S., 71 percent of total government spending is federal and 29 percent is state-local. The opposite is true in Canada, where 38 percent is federal and 62 percent is provincial and/or local. As Chris Edwards, notes: “. . .unlike U.S. states, Canadian provinces can freely borrow and spend without having to balance their budgets each year. During the 1990s many provinces trimmed their budgets and enacted reforms such as cutting welfare. Spending as a share of GDP fell. But over the past decade spending has risen again. Ontario, for example, has a spendthrift premier who has driven the provincial debt up to 37 percent of provincial GDP.” Accountability by all levels of governments, therefore, is very important. It’s Your Money. Your Life. Taxpayers need to take charge of their after-tax affairs to control future wealth and build economic clout. The privilege to vote prudently for responsible stewards of tax dollars, is an important component of that success. 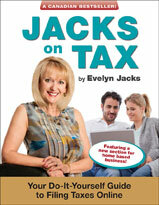 Evelyn Jacks is president of Knowledge Bureau and author of 50+ books on tax and personal wealth management. Her newest book Jacks on Tax: 2014 Edition will be available in December. She is also the founder and director of the Distinguished Advisor Conference (DAC). The theme of the 2014 three day think tank in Horseshoe Bay, Texas Nov 9-12 will be “Think BIG: Find the Sweet Spots in Wealth Management” Follow Evelyn on Twitter at @EvelynJacks. Can employed and self-employed people claim the same expenses for home offices at tax time? The answer is no. Whether you are employed or self-employed matters; the following checklist can help you determine where your deductions fit. capital cost allowance (although this is not a good idea if the home is your principal residence. That’s because CCA claims will compromise the principal residence exemption). You should also know that home workspace claims are limited to income earned in the year. But the good news is that non-deductible home office expenses may be carried forward (indefinitely) to reduce income from that employer (or business income) in subsequent years. It’s Your Money. Your Life. It’s important to gather all receipts and keep them on hand for audit after tax season. This includes a completed Form T2200 Declaration of Conditions of Employment, on which the employer certifies that the employee is required to maintain the home office and pay the expenses of operating it. Year end is a good time to chase down both the receipts and your employer’s signature. Agathe Côté, Deputy Governor of the Bank of Canada, spoke of one of my favorite subjects – the Promise of Potential – at the CFA Society Winnipeg/Manitoba Chambers of Commerce in Winnipeg on October 29. We at the Knowledge Bureau like to think about the promise of potential by measuring knowledge outputs of tax and financial advisors. The Bank of Canada, on the other hand, reviews its estimates of potential output growth in our economy every October. This measure also helps us measure inflationary pressures, providing a key to understanding our future standards of living. To make this more relevant, the Deputy Governor asked her audience to consider this: if potential output were to grow by an extra percentage point every year for the next ten years, the cumulative increase in income would be almost $30,000 for every Canadian. That’s significant in embellishing lifestyle, particularly in retirement. At the moment, the report card on Canada’s economic growth is tepid, particularly in the shorter term. Looking ahead, the Bank sees the economy gaining momentum but not until next year and 2015; however, there is still uncertainty and risks around the outlook, said the Deputy Governor. It turns out that my home town of Winnipeg is well positioned in its Promise of Potential, according to the Deputy Governor. It has a productive and skilled workforce, diverse industry, healthy investment in research and development, and an unemployment rate that is consistently among the lowest in Canada. This province, in other words, has the necessary tools to build productivity and prosperity, said the Deputy Governor. Also noted in the speech: potential economic growth faces the obstacle of an aging demographic that typically contributes negatively to labour productivity, while at the same time, Canada cannot count on commodity prices with certainty to provide the same boost to income growth in the future as they have in the recent past. It’s Your Money. Your Life. Taking a close look at how you manage money, debt, and taxes is a good idea as part of your year-end planning activities to maximize the Promise of Potential in family finances. It can also help you focus on where your personal productivity can make the biggest difference in the current economic cycle and how the productivity of your investments will add positively to your financial future.